It has been a long time since my last review, but I haven't had the time. However, I thought I should at least do one Christmas-themed review in December and which film would be better to review than my all-time favorite Christmas movie? 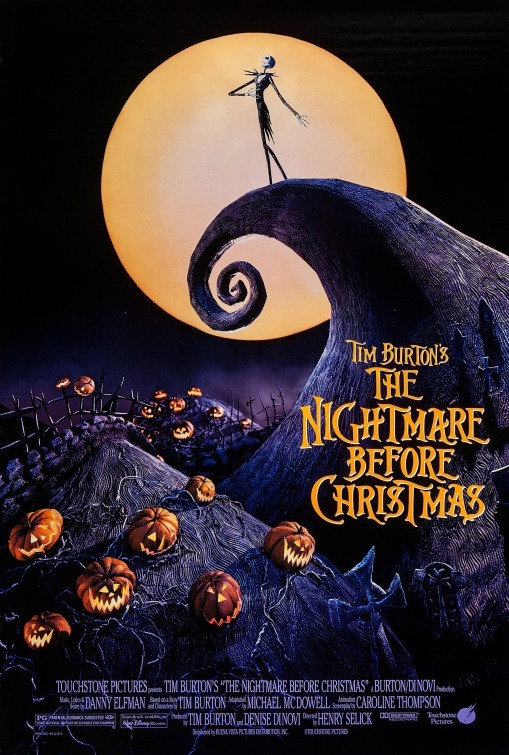 The Nightmare Before Christmas (Henry Selick, 1993) is a stop-motion animated musical. Based on an idea by Tim Burton, whose name appeared so often in the marketing people still think he directed it, the film combines elements from both Halloween and Christmas, resulting in a child-friendly and slightly morbid look at the holiday season. In this review, I will argue that the film highlights one of the main problems of cultural studies: whether or not it is possible to describe or replicate another culture within the language of one's own. The film is set in a world where every holiday has its own world and we begin in Halloween Town, where Jack Skellington (voiced by Chris Sarandon, singing voice by composer Danny Elfman), "The Pumpkin King", has grown tired of doing the same thing every year. He leaves town during the celebrations and accidentally ends up in Christmas Town. He is fascinated by this strange new holiday and returns to Halloween Town, trying to explain Christmas to the other residents. While they are unable to grasp the concept, Jack still wants to celebrate Christmas this year and so the entire town gets to work. And, of course, there is a love interest and a villain and Santa Claus (in Halloween Town called "Sandy Claws") gets kidnapped. I will not discuss the plot further, but I will briefly discuss the love interest Sally (voiced by Catherine O'Hara). Sally is a Frankenstein's monster-like doll, who frequently drugs her creator because she is restless and curious and wants to see the world outside the lab. She is the one who pursues Jack, who barely notices her because of his obsession with Christmas, but not in an aggressive or comedic way. It is clear that she is concerned about him and she seems to be the only sane and clever person in Halloween Town. She is an interesting character, but her and Jack's romance does seem a bit forced. They could have made her his sister without having to change too much. Back to the original topic: what does the film say about cultural studies? Firstly, when Jack attempts to explain Christmas to the other residents of Halloween Town, they simply do not get the point. They are stuck within their own language and culture, which results in them asking confused questions like whether there still is a foot inside a Christmas stocking. When they try to make their own Christmas presents, to be given to people who celebrate Christmas, they make gifts like a murderous doll or a severed head, things they would consider proper gifts. Their actual language is also different from the language of Christmas Town and the real world. They describe a very successful Halloween celebration as "our most horrible yet" and, because of this usage, they do not understand that their version of Christmas has failed when it is referred to as "horrible". Secondly, while Jack is obviously more knowledgeable about Christmas, he still does not understand. He attempts to understand the wonderful new holiday he encountered by reading books, for example A Christmas Carol, and by performing scientific experiments on toys and Christmas decorations (he even dissects on a teddy bear). Finally, he decides to stop trying to figure out Christmas and simply make his own. There are two ways of viewing this "horrible" version of Christmas. One could say that it should not be called Christmas, because of their cultural ignorance and how the people who normally celebrate Christmas react to it. It could even be compared with the Satanic "Black Mass", a perversion of the Catholic Mass. However, one could also argue that they are simply doing their own thing and are actually enjoying it themselves. They are not trying to ruin Christmas; they just wants to be apart of it. Their fault is not malice, but ambition and thoughtlessness. In a way, the film does not give a definitive answer to the question about culture and language, but it does not have to. In the humanities, we rarely want those anyway. It is more meaningful to present different possibilities to highlight a question, rather than to provide a simple answer. I love this film. The story is interesting, the characters are great, the animation is amazing and the music is spectacular. All songs are written by Danny Elfman, mostly known for his work on Tim Burton films like Batman (1989) and for the theme song from The Simpsons (1989-). On the whole, the film is very memorable and has some great re-watch value. Personally, I watch it every Christmas!